You’ve just entered a dangerous Wasteland, and in order to survive, you must have reliable war machines by your side protecting you from vicious residents of this new post-apocalyptic world. 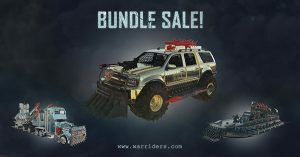 In order to pre-order vehicles from War Riders, you need to access the website via a compatible browser on desktop or mobile. For the best experience, we strongly recommend that you use Chrome or Firefox browsers on desktop. The desktop users should use a MetaMask (or similar) extension to access, view, purchase, and interact with our dApp. The mobile users may use use Cipher, Coinbase Wallet, or Trust browsers. You will need a virtual currency called Ethereum to be able to pre-order vehicles from our site. Depending on your region, you can usually buy Ethereum from a licensed exchange or broker. US citizens can use Coinbase or Gemini to purchase Ethereum and then transfer it to your MetaMask account. Using MetaMask is a fairly straightforward process but can be confusing for some inexperienced users. Chainbits has a great article on how to use MetaMask, send and receive tokens, and recover your wallets; read it here. You can also read the official MetaMask guide here. Using mobile browsers is still a bit challenging, but we recommend Trust Wallet or Coinbase Wallet. The mobile browsers are similar to the MetaMask extension fashion, and there are videos on youtube showing how you can use it. You can now preview the vehicle total supply, live stats, and browse inventory. Only the premium vehicle kits are offered for sale at this time. Click on pre-order under the premium vehicles and choose the vehicle kit you like. You can see the specific vehicle stat ranges, the current price, and some more useful information that our dApp is reading directly from the Ethereum blockchain. The price increases with every vehicle sold, so hurry up and get your ride before everyone else! Click on pre-order, confirm that you would like to proceed with a purchase, and finalize the MetaMask transaction. Once the transaction is complete you will see a successful confirmation. You can also see your transaction in the metamask history. Please note that completing a transaction may take time depending on the current Ethereum network load. We are excited to be able to allow people to buy vehicles in batches by submitting a single transaction. There is currently no limit on how many vehicles you can pre-order in a single transaction. Click here to learn more about bulk buying. Why should I buy multiple vehicles? The more vehicles you own, the more powerful you are. We recommend that you buy multiple vehicles ensuring your army is all set for the deadliest battle in human history. The vehicles do compliment each other, and we suggest buying as many as you can! How do I know what vehicles stats I will get? After you have successfully completed your purchase, click on MY VEHICLES to check out your new shiny ride. All the vehicle kits will be displayed there. Shortly after pre-orders are complete, you will be able to customize your vehicles and make them truly unique. The players will be able to customize the color, body parts, wheels, guns, install additional equipment, and put the personal message (logo) on the vehicle. War Riders is not offering BZN for sale, and there will never be an ICO. Instead, all War Riders vehicles will come with a tank which will be filled to the top with BZN at the end of the pre-order campaign. The BZN truck will stop by the garage with a huge nozzle to disperse BZN straight to the user’s wallet. Let’s say a player bought 10 War Trucks with 400 BZN tank capacity in each, at the end of the pre-order campaign the BZN truck will fill you up with 4,000 BZN. Filling vehicles with BZN officially kicks off the “preparation for the Apocalypse” process and allows users to immediately have access to the valuable resource. All additional BZN will be discoverable in the Wasteland and will recycle with a 30% burn (when players use BZN in the game, all unburned BZN goes back to the same game pool). This mechanism ensures Benzene will never fully run out but will become extremely scarce. BZN will be worth $0.5 according to the Official Internal Wasteland BZN rate. The prices for guns, garages, and all additional stuff will be tied to USD on our site and BZN will keep this rate until early 2019 or after the full release of our game. You will have an option to buy the additional items with Ethereum (in USD equivalent) or BZN equivalent. We also have plans to provide credit card support in the nearest future. Anyone can become a virtual vehicle dealer and earn ETH during our pre-sale. Your unique link is available to you at the bottom of each page on the pre-orders side of our website. Copy the link and share it with your friends on social media or via private message. Every time someone lands on our webpage using your referral link your ether address will be linked to that person in our system. When that person makes a purchase, you will automatically get 5% of the total amount in ETH transferred to your wallet, even if that person left the site and came back in a few days using a direct link. Please note that there is currently no way to unlink the referrers address, other than landing on a different referral link from a different person. That way our system automatically registers a new referral. Please note that the Ethereum network does charge a small fee for each transaction. This fee is not fixed and depends on the current network load. The support for the payment-related issues will be provided via the internal ticketing system that you can access here. We will try to respond to all tickets as soon as possible, but please note that depending on the amount of inquiries it may take us up to 48 hrs to get back to you. We will be responding to tickets Mon-Fri 9am-5pm EST. The community support will be available via our Discord and Telegram groups. The War Rider’s vehicles will be tradable on OPSkins, WAX, OpenSea and similar marketplaces for US dollars, Euros, WAX Tokens, Bitcoin, ETH, and dozens of other currencies. BZN is also coming to OPSkins, WAX and more exchanges soon. Due to the irreversible nature of blockchain we will not be providing any refunds or exchanges. We can not stop, revert, or cancel any transaction on the Ethereum network. Please always verify each transaction and never share your private key or secret phrase with anyone. Please back up your seed phrase and keep it in a safe, offline place. Please note that we are not able to restore any wallets and that your assets will be lost forever if you lose access to your MetaMask account. Everyone needs to have a game account in order to participate in customization and eventually play the game when it launches. You have to link your Ethereum wallet to your game account and pick a unique username. Follow this guide to create a new account. Copyright © 2019, War Riders. Made with love by Cartified.